APOLOGY – not really ICT based as my usual content on this blog is but is very much about teaching and learning. These are two quick and easy activities for developing the use of terminology, consolidating understanding, applying knowledge and making synoptic links that I use with my A’level group. Can be used to help develop synoptic links and help students identify synoptic links more quickly if using vocabulary or named examples from across the spec. The example below is Glaciation based (after the first few weeks of introducing the topic) but can be used at any time in the course and with any topic. It is good for checking as you go that students can see the links between the knowledge they are developing and is good for revision at the end of a topic. It is really flexible – only involves writing words on board (so little prep needed) can be done with any topic – physical or human AND a variety of words from across topics to get the synoptic links going. (We are particularly focusing this year on trying to build student capacity to make links within and between topics throughout the A Level course). First you need a set of words – either on the whiteboard or given to students – for example..
– can just be done in pairs or teacher led asking individuals. (ii) Students have to choose two words that they are going to make a link between in a sentence. How does it work: Students to make a sentence with any two words on the board (so starts like work link) – e.g. The next person has to start their sentence with the second word that the student before used so would start with Polar Glacier and link to another word – e.g. Next students has to start with internal deformation e.g. The challenge for the student becomes how to then link to another aspect – so the next student could change the focus from types of glacier to mass balance by then saying “Warm based glaciers will be in retreat if there is a negative mass balance“. So basically students are ‘bouncing’ a word to the next in team to make a link between and build a sentence with – I have found that this can become very competitive as the aim is to keeping going from person to person for as long as possible without stopping – you could do it where they can use the same word twice in a different context – OR to make it harder – give them a copy of the key words and they have to tick them off as they use them so those words can’t be used again. Back in January I ran part of a training session for a local network of Geography teachers. The main session was taken by Jason Swale from ESRI UK looking at the fantastic ArcGIS and the ways in which it can be used to successfully integrate GIS into the curriculum, particularly in light of the new GCSE and A’level specifications. Prior to this I did a short 30 minute session exploring some of the ways in which new technologies can be utilised in the teaching and learning of Geography, drawing particularly on some of our experiences in the ways we use it in my department at St Ivo School. Here is the presentation summarising the key ideas discussed during the session. In case it is useful you can download the handout of links I gave out on the evening here to help explore some of the ideas covered in more detail. Continued formative assessment is an integral part of the work in our classroom and with the continuous development of new technologies there are various excellent apps and sites which can support staff with different types of assessment. One of my favourite tools is the Quick Key app. Assessment of pupil progress in Quick Key enables quick assessment by using your mobile or tablet as a scanner which instantly marks students answers saving you time grading the papers which can be used instead to provide feedback and support student progress by identifying and tackling areas of weakness in knowledge and understanding. This allows you to focus your time on the students and doesn’t require students to have access to technology as the answers are completed on paper! So how does Quick Key work? You simply need to sign up on the website for a free account. Once your account is set up you can start adding students. This can be done manually or by importing student lists, for example as a .csv file. Once you have imported students you can then create classes and allocate students to the relevant classes. You are then ready to create a Quiz – this can be up to 30 questions. You can insert your question and make it clear on your quiz, which of the answers is the correct one (i.e. multiple choice). In terms of running the quiz you can read the questions out to the students and the options or have them on powerpoint slides. In our department I have opted to create a quiz format sheet which has the questions by the side and the possible answers by the questions (where I am not using all the possible multiple choice options boxes are blanked out). 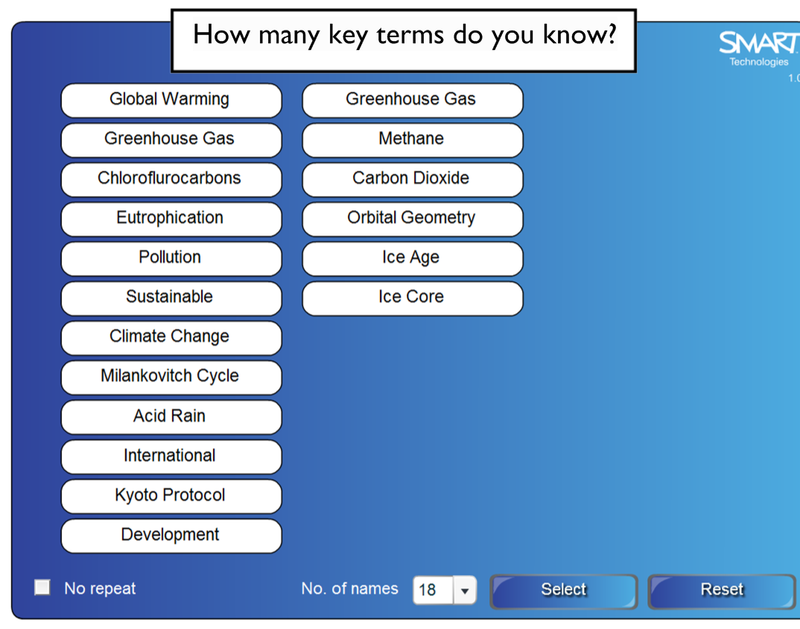 Students simply fill the answers in on the ‘exit ticket’ which can be downloaded from the site. I have incorporated this into the base of our quiz sheets. Each student is allocated an ID number which they must add to their exit ticket. Once students have completed their tests, you can use the QK app on your phone or tablet to quickly scan each paper and the marks will be allocated to the relevant student. I have marked a set of 30 students in less than 2 minutes before! I am particularly using this at the moment for frequent assessment of Year 10 and 11 students. The answers are marked within seconds so I can give students feedback within minutes which makes the whole process more useful. I then either go through the questions with the students and their papers and the just highlight the answer to the questions they got wrong or if at the end of the lesson I do this for them as my ‘marking’. Results are saved for each students for each task so you can easily build up a continuous record of assessment – useful for a quick snapshot of student progress in between more extended end of unit tests. Once you have created your classes and quizzes they are located easily on the Quick Key dashboard. You can easily re-use and assign quizzes to different classes and in our department we are working together to build a bank of department Quick Key assessments. There is a Quick key facebook page so you can share with other colleagues you think might be interested and remember, you can download the quickkey app from the itunes app store – full details available here. Showbie – an app for collecting, reviewing and annotating student work. Showbie is an app which lets you distribute assignments to your students (with associated instructions and resources) through the creation of classes which your students can join and log into. Students can then submit their work through showbie which keeps everything organised together. It is possible then to add annotations, voice notes and text feedback directly onto students work for them to pick up. A colleague is currently using this successfully with their Year 13 class and I am looking forward to giving this a go and exploring its potential! The video below provides a summary of how Showbie works. There are a number of options for Showbie – from a free teacher account and a free school account through to Showbie Pro (a paid option for schools) and more details can be found here.